American made tie rod or drag Link rebuild kit for the 1928-34 Ford. Contains the items needed to replace the small parts in the ends of the tie rod or the drag link. (You would need two of these kits per car). Made in USA. Full kit to rebuild the tie rod and the drag link on the 1928-34 Fords. (You would only need one of these kits per car). USA Made. If you have already purchased the E-Z Steer Kit (A-3305-SE) and need to replace only the teflon seats, this is the kit. Note: Will not work with the original style tie rod/drag link rebuild kit. U.S.A.
Full modern kit for both the tie rod and the drag link. This kit uses special teflon seats against the ball for easier and smoother steering. Eliminates the drag. One kit does the whole car. Weld in Ball stud 1928-34. If your steering balls are worn, it is best to replace them. Worn balls will create quite a drag on the steering! With this style of ball, you simply cut off the old ball, drill the hole, slide the new ball stud in place, and weld! 4 of these are required for a Model A. Ball diameter 1" Shank 1/2". Tie Rod End for the 1928-31 Ford Model A Left Side. This is the machined casting only with the left hand thread, no internal parts are included. Tie rod end for the 1928-31 Ford Model A Right Side. 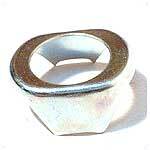 This is the machined casting only with the right hand thread, no internal parts are included. Drag Link for the 1928-31 Model A Ford. This is the link that runs from the pitman arm at the steering box to the front steering arm. This is the link only, it does not have any of the internal parts. Tie Rod - Drag link Seal set for the 1928-34 Fords. These are the rubber seal that keeps grease in and the dirt out of the tie rod & drag link. Set of 4.
with authentic style radius cap assembly. A loose radius ball can cause steering problems. This is a quality American made kit. A low cost aftermarket complete cast iron replacement cap assembly. This style uses a rubber ball to absorb shock. This is not the original style cap and can cause the steering geometry castor angle to change. We recommend the original style A-3440-S kit. If the ball on the end of your wishbone is badly worn, this washer will help to take up the slop when using the original style A-3440-S radius kit. The washer is .075" thick. Radius arm ball felt for the 1928-31 Model A Ford. The heavy felt pad that is placed inside the bell housing directly over the radius ball. Radius bushings for the 1928-31 Model A Ford with the original style radius cap assembly fitted. These are the bushings that slide over the bolts as spacers. Set of 2. On the early style emergency brake cross shaft, these springs pushed against the A-2839-R bushings to keep the cross shaft centred. 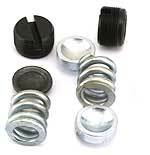 They are also the spring used in the original style radius rod cap assembly. 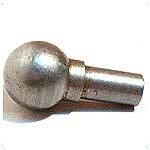 This is the long spike-like pin that holds the radius cap bolts from turning inside the bell housing. Made in USA. Radius ball socket bolt set for the 1928-31 Model A Ford. The special bolt with a slotted head that is fitted inside the bell housing. The retaining pin fits in the slotted head to hold them in place. Set of 2. Radius rod nut set for the 1928-31 Model A Ford. These are the nuts for holding the original style radius rod cap in place. Set of 2. Radius arm ball for the replacement style ball cap assembly. This is the oil resistant neoprene ball that goes over the steel radius ball. Also fits the 1932 - 1940 Ford V8.